Join us at our upcoming Flying Solo event on Wednesday 27th March 2019. The rewards of working in a smaller in-house team are many, yet it can feel isolating. This free-to-join forum brings together in-house lawyers working solo or in smaller teams to network and learn from one another. A chance to connect, swap stories, debate topical issues and share ideas. All driven by a passion to support each other to succeed. Efficiencies for the small in-house legal team. This session will be a panel discussion and will aim to provide practical ideas for efficiencies – tech or otherwise. Panel members: Atik Ahmed; Manu Kanwar, Kate Burns and Derek Southall. Panel will be facilitated by Sophie Gould. Radius Law will be attending this year's Car Dealer Expo at Manchester Central on 21 and 22 May 2018. Visit us at stand E7 to find out more about our automotive expertise. Iain Larkins, the founder of Radius Law, worked exclusively in automotive for almost 15 years and so a large portion of our clients are in this sector. 5 weeks to GDPR day, what now? Join us for a webinar on Wednesday 18th April from 10am to 11am to better understand the implications of the General Data Protection Regulation (GDPR) ahead of its implementation date of 25 May 2018. 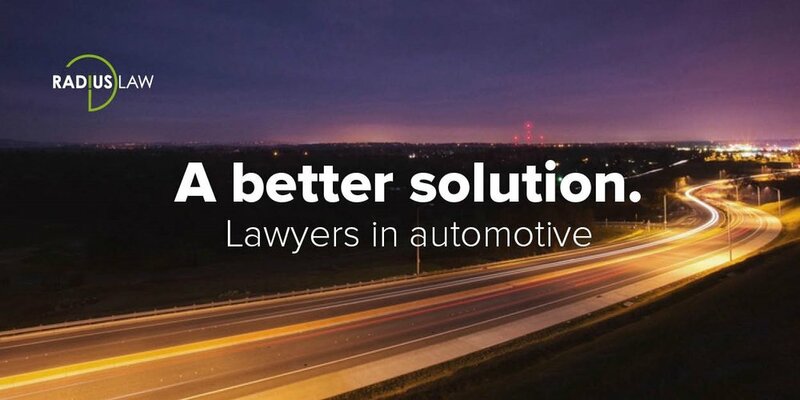 The webinar will be presented by Iain Larkins, founder and head of the automotive practice at Radius Law and the Motor Ombudsman, Natasha Gasson. There will be opportunities to post questions throughout the webinar. You can sign for the webinar here. Are you an in-house lawyer working solo or part of a small legal team? The rewards of working in a smaller in-house team are many, yet it can feel isolating. This free-to-join forum brings together in-house lawyers working solo or in smaller teams to network and learn from one another. A chance to connect, swap stories, debate topical issues and share ideas. It aims to provide regular legal and soft-skills training, as well as mentoring, research papers and benchmarking services. All driven by a passion to support each other to succeed. Legal news update – a round-up of the latest news led by Iain Larkins of Radius Law, focused on the commercial aspects relevant to you and practical next steps to consider. Brexit – an interactive session will be led by Holly Nankivell from the LexisNexis PSL team. It will include a brief overview of the latest and most pertinent legal issues and practical implications to consider, followed by more in-depth breakouts to discuss and share insights. Please also join us for light refreshments and networking after the breakout session. Places are limited, so please book now to avoid disappointment. BOOK NOW! This will be a popular event so please reserve your place now by emailing yorkshire@cigroup.org.uk and letting us know if you would like to attend the morning or afternoon session. Radius has teamed up with some other businesses including Lancaster Volkswagen, St James’ Place, Barclays, Freshly Brewed & Haines Watts Accountancy to form Apex Business Leaders. The idea of Apex is to provide valuable information and collaborative events for business leaders in fast growth and mid-size companies. We have a series of events planned in 2017 and you can view the 2017 schedule here. Our first event of 2017 is titled Scaling Up, or selling Out. 'Scaling up, or Selling out' will look at how we view, manage and enjoy our businesses. This is not a seminar on buying, investing or selling, it is about how business and personal drive together with lifestyle objectives interact and impact over time, using real life examples. There are 7 Key stages in the business life cycle. Understanding these and aligning them with the owners’ personal ambitions is critical to meeting their goals, be the entities private companies, family businesses or third-party funded companies. In short, how we can be happy and successful in our business, maintaining motivation to be able to meet our financial, intellectual and other personal needs. Wherever you are at in your personal or business life cycle, this seminar will be for you. This two day course is aimed at solicitors moving in-house for the first time and will also provide a useful refresher for those returning from a career break. It gives an overview and update of the areas of law in which your advice will most commonly be sought. The course also provides invaluable advice on integrating the legal team into a business and “selling” its value to your internal client. The course is not intended to deal with commercial contracts and solicitors who do not have a background in commercial contracts may also wish to attend the 2 day Certificate in Commercial Contract Drafting. • TUPE - when does it apply? - what rights does it create? • Client care and selling the value of an in-house team. Have You Managed Your Risk? Early prosecutions under the Bribery Act may not have been as blockbuster as many had expected with a couple of low grade offences, but the SFO now has a major prosecution completed and has announced a pipeline of cases and access to blockbuster funding. With the SFO swinging into action it's important that all companies have effective systems in place to minimise corruption risks. With a mix of presentation, interactive discussion and video, this course will show you how to establish an effective anti-bribery compliance programme. Join us for an interactive discussion on the bear traps, top tips and innovative solutions for navigating the maze of employment. This session will explore issues such as: zero hour contracts; identifying when contractors become employees; TUPE liabilities and much more. This 'ties off' session will be led by legal and finance professionals but there is no death by PowerPoint; it's an interactive discussion with the opportunity to also share and learn from your peers. As it is an evening event, we'll ensure there is plenty of food and drink too! Managing Directors, Finance Directors, Human Resource Directors & Operations Directors of large and medium sized companies based in Hertfordshire & surrounding areas. This course is organised by Central Law Training. The cost of the course ranges from £99.00 to £300.00 depending on package selected.